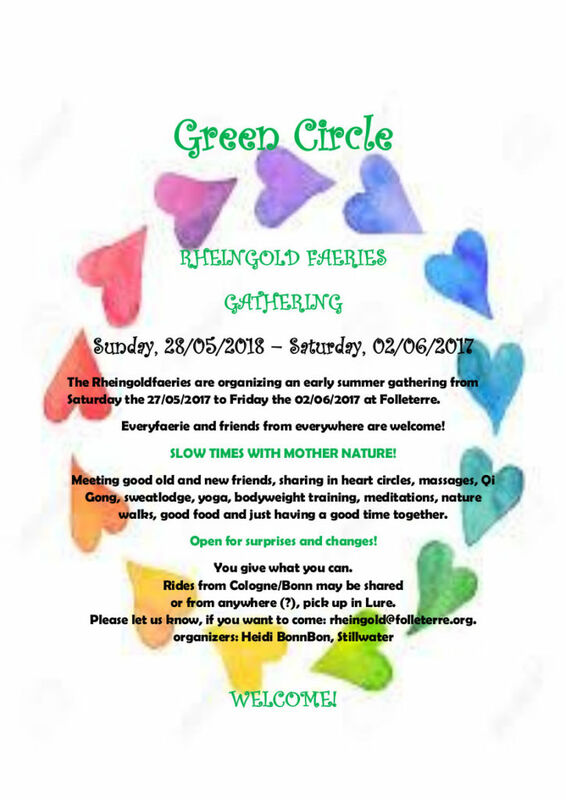 The Rheingold faeries are organizing an early summer gathering from Saturday the 27/05/2017 to Friday the 02/06/2017 at Folleterre. Everyfaerie and friends from everywhere are welcome! SLOW TIMES WITH MOTHER NATURE! Meeting good old and new friends, sharing in heart circles, massages, Qi Gong, sweatlodge, yoga, bodyweight training, meditations, nature walks, good food and just having a good time together. Open for surprises and changes! You give what you can. Rides from Cologne/Bonn may be shared or from anywhere (? ), pick up in Lure.